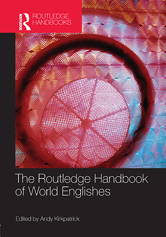 The Routledge Handbook of World Englishes constitutes a comprehensive introduction to the study of world Englishes drawing on the expertise of leading authors within the field. The handbook is structured in nine sections covering historical perspectives, core issues and topics and new debates which together provide a thorough overview of the field taking into account the new directions in which the discipline is heading. Among the key themes covered are the development of English as a lingua franca among speakers for whom English is a common but not first language, the parallel development of English as a medium of instruction in educational institutions throughout the world and the role of English as the international language of scholarship and scholarly publishing, as well as the development of 'computer-mediated' Englishes, including 'cyberprose'. The handbook also includes a substantial introduction and conclusion from the editor.